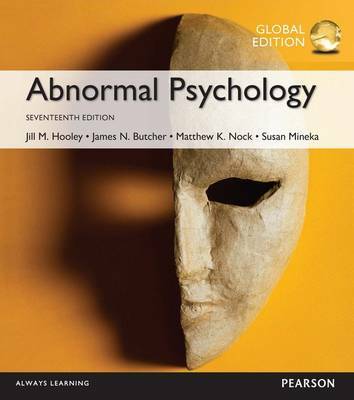 Author(s) Butcher, James, N.; Hooley, Jill, M.; Mineka, Susan, M; Nock, Matthew, K.
Abnormal Psychology provides a comprehensive and engaging introduction to the primary psychological disorders studied within the discipline. Maintaining a focus on the individuals at the heart of the study of abnormal psychology, the authors employ a biopsychosocial approach that helps students achieve an understanding of the holistic context in which abnormalities of behaviour occur. In addition to the contributions of new co-author Matthew Nock, the Seventeenth Edition has been extensively updated to reflect DSM-5 diagnostic categories, classifications, and criteria.